The AR500 Armor® Level IV hard armor sideplate is a cost effective, multi-hit rated, NIJ .06 compliant plate that offers excellent Level IV protection. Professionally wrapped, water resistant, and manufactured 100% in the USA. Raising the bar, yet again, AR500 Armor® has continued its pursuit of excellence by bringing more advanced armor to the market at the lowest possible price. Never worry about sacrificing quality for cost again! Designed for both tactical and civilian use, our new line of level IV plates were designed to bring the highest level of personal protection to the consumer. 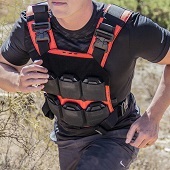 Designed to be used as either a front or back plate (or both) and to be compatible with our full line of trauma pads and IIIa soft armor, this line of level IV armor is sure to help you #STAYintheFIGHT! Level IV multi-hit protection against .30 caliber armor piercing (AP) bullets (U.S. Military designation M2 AP) with a specified mass of 10.8g (166gr) and a velocity of 2880 ft/s (+/- 30 ft/s). You're reviewing: AR500 Armor® Level IV Body Armor 6" x 6"